Excel can be a great tool for tabular data or rudimentary forms, and sometimes you can even use Excel as a simple database. Many of our clients love Excel for its simplicity, and initially request that we help them improve their system by extending Excel’s functionality. But in most cases their requirements have outgrown Excel’s intended functionality, and Excel is no longer a good fit for their business. In this article, I will share some insights that help determine when it is in your best interest to convert your Excel sheets to a real database. One clue that you should move away from Excel is that you are starting to accumulate large amounts of data. Excel not only has a limitation on the number of records per sheet, but also suffers performance issues as data grows. One solution is to separate the data into many sheets or files, but this quickly becomes a headache to organize. If you segregate your data it becomes much more difficult to work with and analyze. Excel is well suited for supporting workflows whose process is fairly linear and its input straightforward. If your workflow is starting to involve entering or displaying information for various types of related information then it is definitely time to move away from Excel. Excel will just make your tasks much harder to complete. 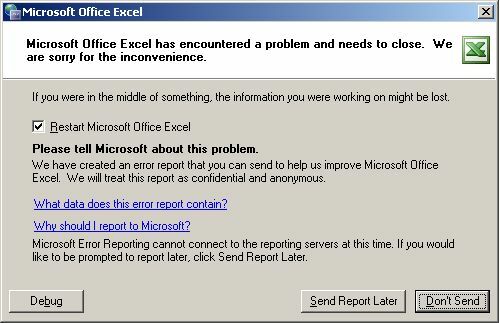 A major impediment when using Excel is its lack of support for collaboration. Even when you enable multi-user editing and store your Excel file on a shared server, the process is error prone and may result in people overwriting each other’s work. Editing the file from outside the office is even more difficult. Emailing an Excel file is tedious and it quickly becomes impossible to keep track of. People in your organization will have many several copies at one time and not know which is latest version. If you require multiple users to access your data and enter information, then it is time to start looking for a more suitable replacement. If you require any level of security or user permissions within the Excel file, then you should look elsewhere. Although Excel allows you to protect data with a password and Windows based permissions, it is extremely delicate and requires a deep understanding of Excel. Some of these features won’t work if you have people using different operating systems or if you need access from other computers. Even a password protected Excel file is not really secure; there are tools on the Internet that anyone can use to unlock a protected Excel file without knowing the password. Excel is great if you stay within the bounds of what is meant to do. If you require specific interfaces or complex tasks, then Excel is not the best option. Once you start trying to accommodate Excel to adapt better to your business, then it is time to move on. It is easy to adapt Excel within reason, but deep customization could take much more work than migrating to a more suitable solution. If your company is having trouble maintaining accurate data then it is time to put Excel to rest. Excel provides limited methods to validate input, and these safeguards can be easily bypassed or ignored. This result in compromised and inaccurate data due to manual errors. The point of using software tools is to make your business more efficient, and therefore more profitable. If you are at the point where Excel is hindering your progress due to tedious and repetitive work, then it is time to look for a solution that can alleviate these issues. Many database driven solutions can automate tasks, and reduce redundancies by storing related information that can pulled at a later time. So there you have it! If you are thinking of using Excel as a database, keep these issues in mind. Have you experienced any other problems that resulted in migrating away from Excel? Were you able to fix them and continue using Excel? Let me know below!